This post has absolutely nothing to do with DIY. To tell you the truth, I’m a little stuck on what I should be writing about next as far as house projects go (and I’m also lacking in the photography department) so I’m going out on a limb here and writing about something completely different! Hey, it’s my blog and I’ll write what I want to, right? FYI- I’m open to all suggestions- anything you want to see/read about in my house? So anyway- aside from DIY and my full time job, I do have some other hobbies. I like to knit, try really hard to sew (but am not very good, much to my mother/sister -in-law’s disappointment), I love to read and I do agility with 2 of my doggies. One thing I just recently discovered I really enjoy doing is running. I actually have been running on and off for quite awhile now, more steadily since 2009. I’ve even run 3 races- a 5K in 2009, a half-marathon (!!) in 2010 and a 15K in 2011. But just recently I discovered that I really like it. My big “aha” moment? I fell. Ha! I totally tripped on a sidewalk half way through a 5mi run (probably because I wasn’t paying attention) and bit it big time- I was bleeding from my knee and elbow. And you know what I did? I got up and kept running. That was when I realized I was a runner! I also have been running pain free since July of this year. What changed? My shoes! So I thought (and still think) that these look bizarre. BUT- a friend of mine started running in them after having a bad case of shin splints, and REI was having a sale/I had a dividend- so I caved. And I am SO glad I did. Before switching to these, I had constant, sometimes severe, knee pain. I wore a knee brace on every run and had pain going up/down stairs. Now- absolutely no pain. Buh bye knee brace!! I’ve never been happier- and running has never felt better!! These shoes definitely take some breaking in time- don’t expect to put them on and go out for a 5 mile run the first day. 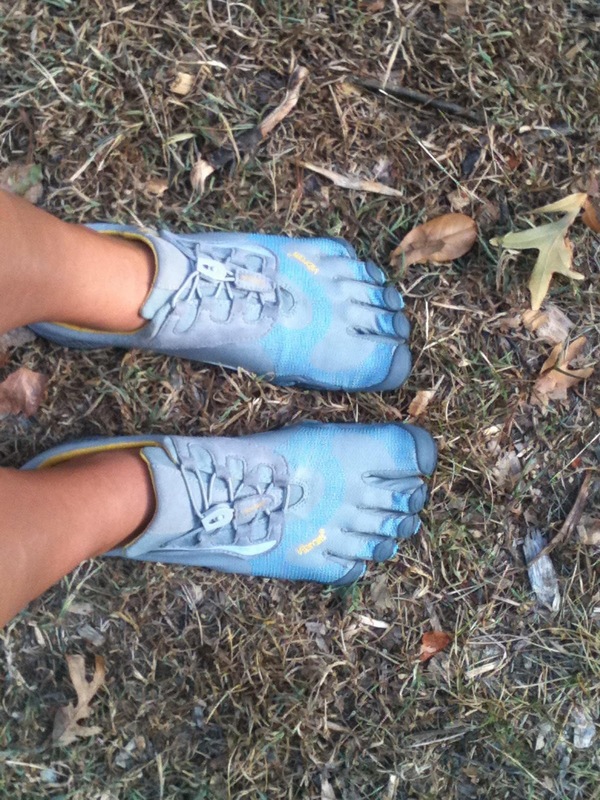 They make you run differently, and work your calf muscles like crazy- break them in SLOWLY. I ran 1 lap around a track the first time I ran in them, and the next day my calves were KILLING me. Seriously. Take it slow- otherwise you can get injured. That’s all I’ve got for now- don’t expect this blog to turn into a running blog, but I might throw in a random post now and again! What sort of hobbies do you have? Any other runners out there?